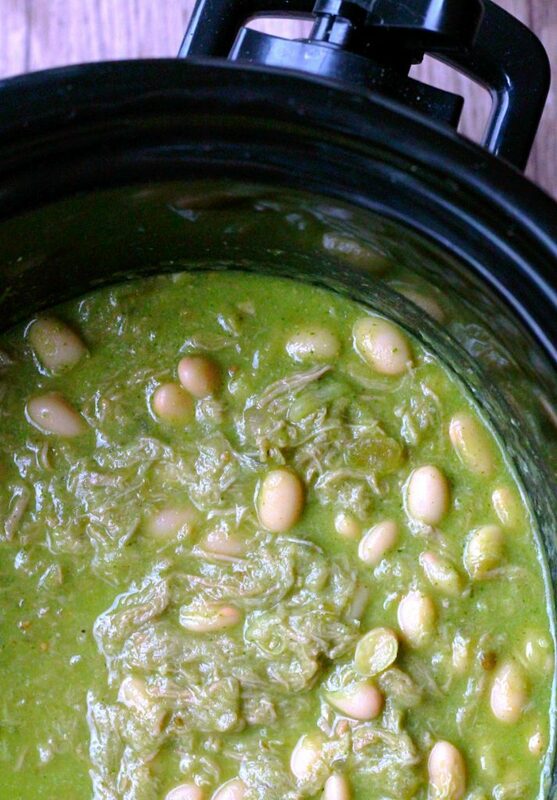 Slow Cooker Chile Verde is a pork chili with fresh roasted peppers, onion and garlic. I love a good chili! This one starts with pork tenderloin slow cooked with tomatillo salsa and combined with a freshly roasted green sauce made with three types of peppers, onion, garlic and cilantro. 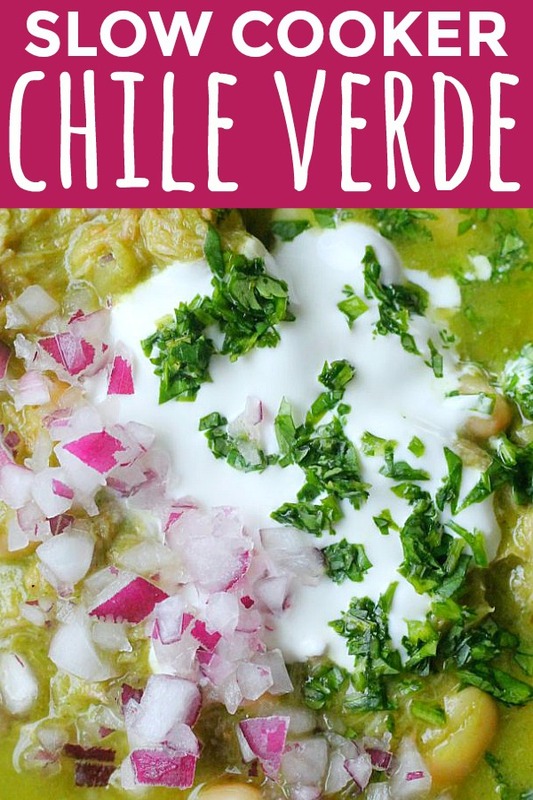 I think you’re really going to love this vibrantly green Slow Cooker Chile Verde! 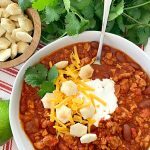 I’ve made quite a few chili recipes over the years with beef and chicken but never one with pork. 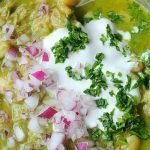 My memory told me that chile verde is a pork based chili and in searching for recipe inspiration I ran across this one. It was just so pretty and green. And let’s face it, while chili is a favorite meal for many, it’s not exactly known for its good looks. 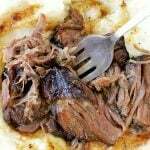 My recipe starts with a pork tenderloin slow cooked and shredded. In the final hour of cooking I add white beans and a green sauce that I roasted in the oven while the pork was in the slow cooker. My sauce combines two poblano peppers, three anaheim peppers and one jalapeno. 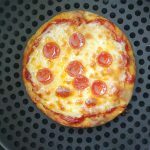 I wanted some heat but not so much that my two kids wouldn’t want to eat it. I also roasted an onion and a head of garlic with the peppers. After roasting I pureed the pepper, onion and garlic mixture with a bunch of fresh cilantro, lime juice and a little olive oil. 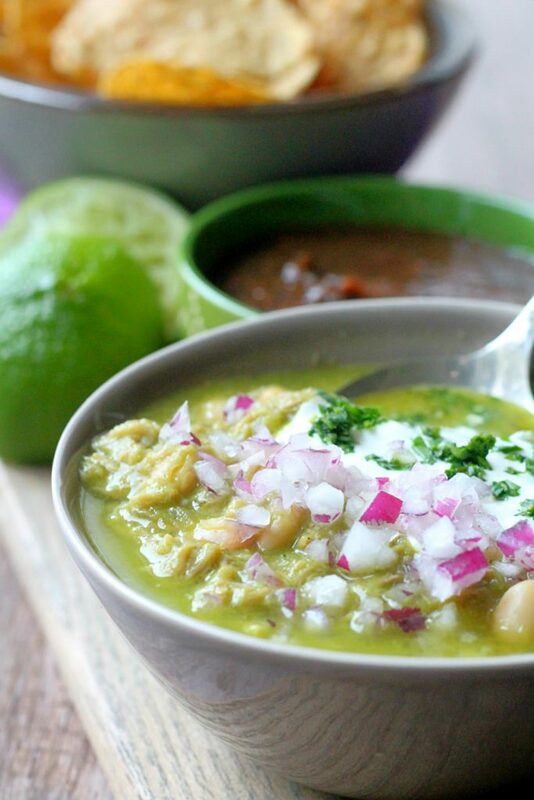 Mixing that sauce in and allowing it to heat up at the very end of the cooking time makes this slow cooker chile verde a fresh and appealing green color. If I’d started with the green sauce at the beginning it would not look quite so appetizing. I was really pleased with how this chile verde turned out. 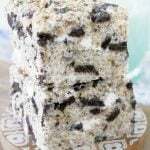 Pretty to look at and delicious to eat. 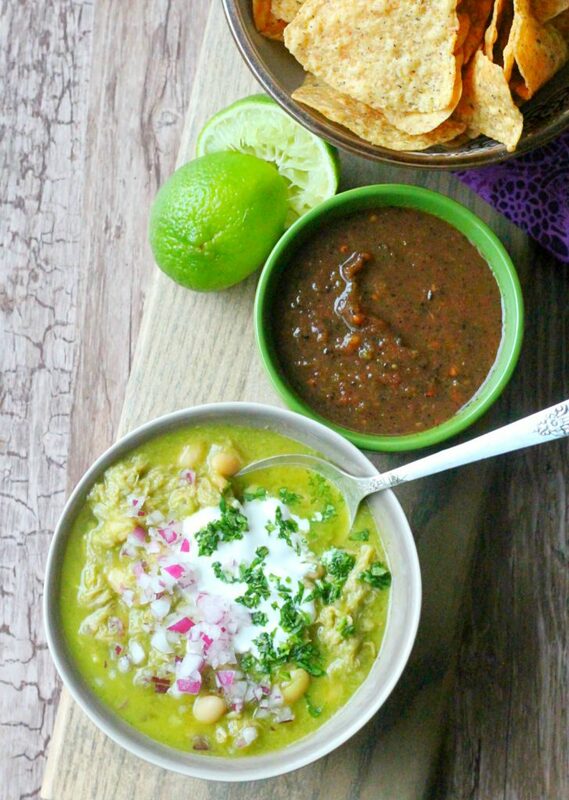 This chili combines pork with a freshly roasted green sauce made with three types of peppers, onion, garlic, cilantro and lime stirred in at the end. 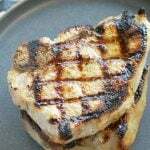 Cut the pork tenderloin crosswise into three pieces. Add the pork, tomatillo salsa, chicken broth and 1 teaspoon of salt to the slow cooker and cook on LOW for 6 hours. 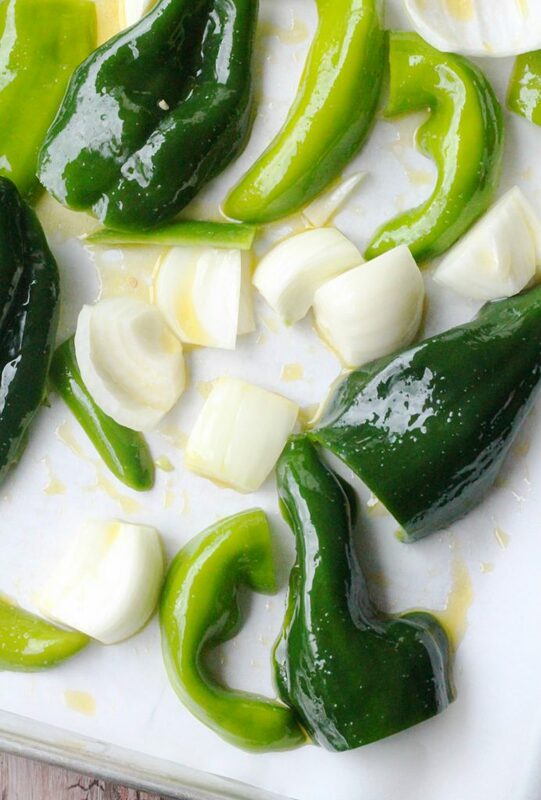 Place all the peppers, onion and garlic on a sheet pan lined with parchment paper. Drizzle with 1 tablespoon of olive oil. Roast the peppers, onion and garlic until browned and softened, about 30 minutes. Allow to cool. Remove the skin from the peppers and discard. Squeeze the roasted garlic cloves from the papery skin and discard. Add the roasted peppers, onion, garlic cloves, cilantro, lime juice, remaining 1/2 teaspoon of salt and remaining 2 tablespoons of olive oil to a food processor or high powered blender. Blend until smooth. 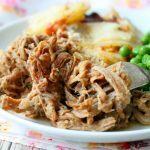 Remove the lid from the slow cooker and shred the pork. Stir the green sauce and the drained beans into the chili. Cover and allow to cook on low for 30 - 60 additional minutes. Taste and add more salt if necessary. 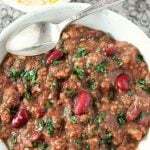 Serve the chili topped with chopped red onion, cilantro and sour cream. Beautiful shot on this soup! Really appetizing! This dish has been on my ‘must cook’ list for far too long, your version looks delicious! Thank you so much Brian. Glad to provide some inspiration to make it. We loved it! When do you add the beans? 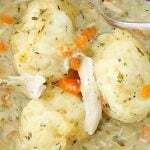 The picture shows then in the dish but the recipe doesn’t call them out or tell you when to add them. Thx! So add them in the final 30 – 60 minutes. 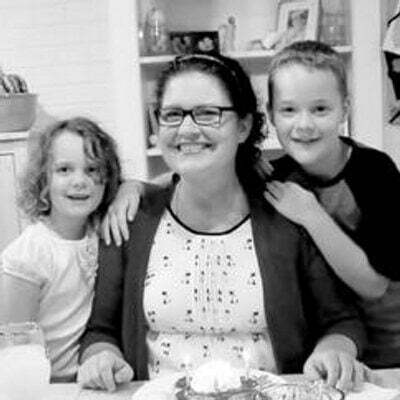 I’ve been looking for new slow cooker recipes, and this one is next in my line up! Looks great! I don’t think I’ve ever had a chile verde! 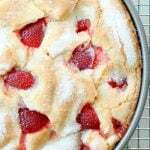 Yours looks and sounds delicious. 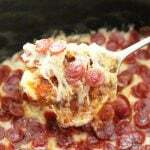 Am always on the lookout for new slow cooker recipes. Going to pin this one for later! Great! Thanks so much for the Pin! 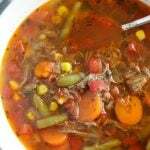 This soup looks so hearty and filling! Lovely photos too! 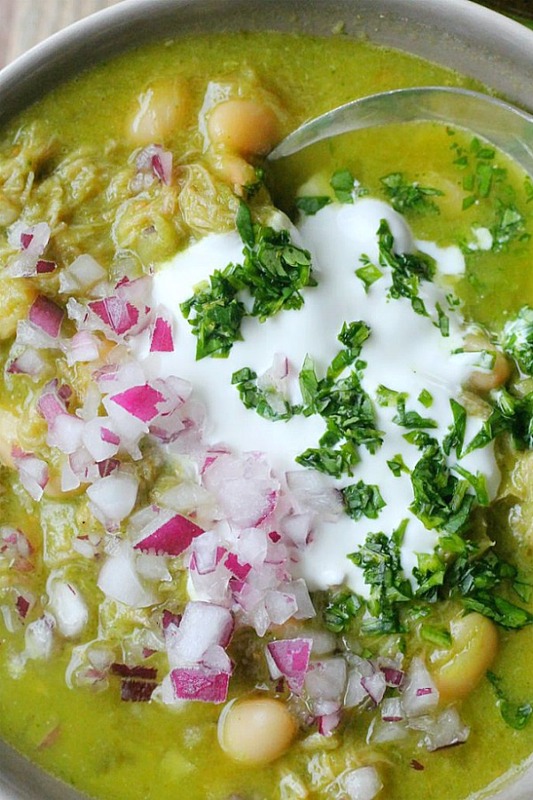 Chile Verde is one of my favorites! 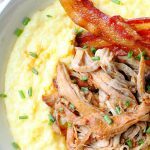 This looks delicious and I love that they are cooked in the crockpot (BONUS)! I would put this on everything! It sounds amazing and perfect for Taco Tuesday or any day!